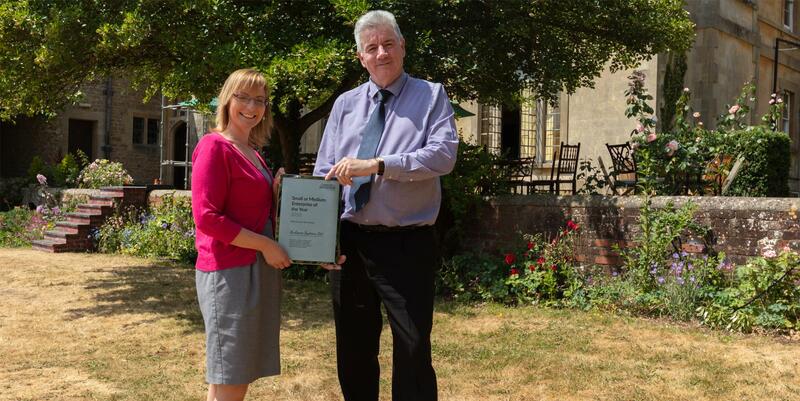 Photo shows Audience Systems’ HR Manager, Hannah Martin with Steven Haines, Enterprise Coordinator / Employment and Skills Officer for Wiltshire Council, who nominated Audience Systems for the award. We're delighted to announce that we have been named SME of the Year in the West & South West by the Careers & Enterprise Company. The award is in recognition for our work supporting careers education and helping young people into the world of work. A record number of over 200 nominations where submitted for this year's nine award categories, which were decided by panel of independent expert judges. Audience Systems was awarded in the SME category due to our programme of activities which support young people into work. We attend careers fairs, assist with mock interviews and offer work experience placements. We also regularly take on apprentices and trainees throughout the business – including in production, project management, estimating, engineering and sales. To add to our own pride our achievements, one of the schools which we work most closely with is Matravers School, Westbury - which was awarded the national prize in the schools category at the same awards ceremony.